Well then, are you enjoying a tranquil, stress-free Christmas season? Me neither. Work, present preparations and many other duties collide with the Christmas anticipation. There’s only Christmas in my kitchen currently and that’s only because I have a blog to fill and feel like I have to. 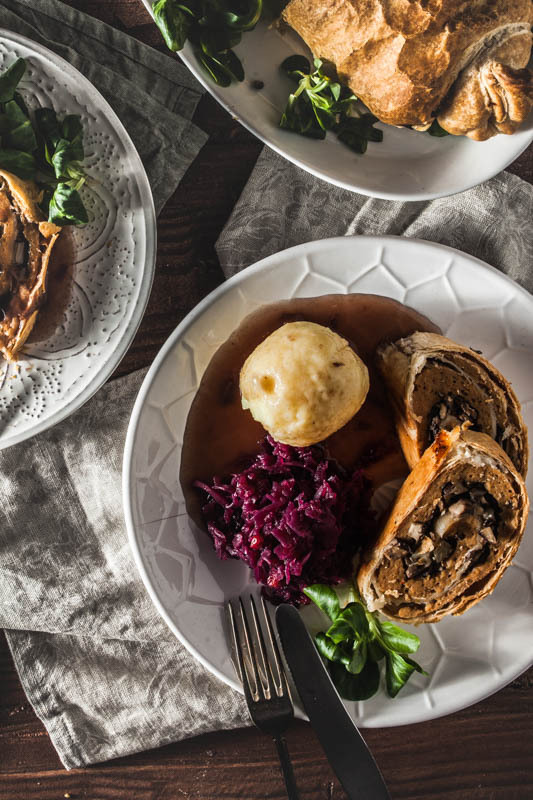 A vegan Christmas Roast? Yes please! I’m driving home for Christmas and being fed by my parents. So I was never accorded the honour of hosting a perfect Christmas dinner. Let alone a vegan one. My family is a gathering of meat lovers. And so am I from time to time. On Christmas Eve we’re eating salmon and smoked eel on toast and a cheese platter in the end. On Christmas day we usually have a bunny roast and the last day of gluttony is celebrated in a restaurant – usually Greek. 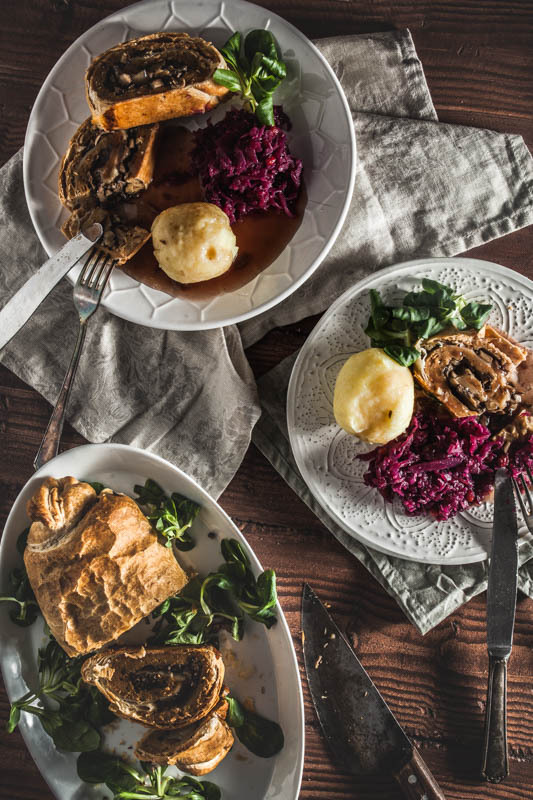 But as I am a Blogger and as I love the variety of the vegan cuisine I asked myself “What if I were to host a fantastic Christmas dinner?” For the vegans I would certainly not want to serve potatoes and gravy only. A vegan Christmas roast has been on my to-cook-list for a while and now I can finally tick it off. I’ve had a pack of wheat gluten in my supply cabinet for a couple of weeks now, without really having an idea what to cook nor feeling curageous enough to even try. I’m not kidding you, I’ve never prepared seitan before. This recipe succeeded at first try! So it’s definitely suitable for absolute beginners. 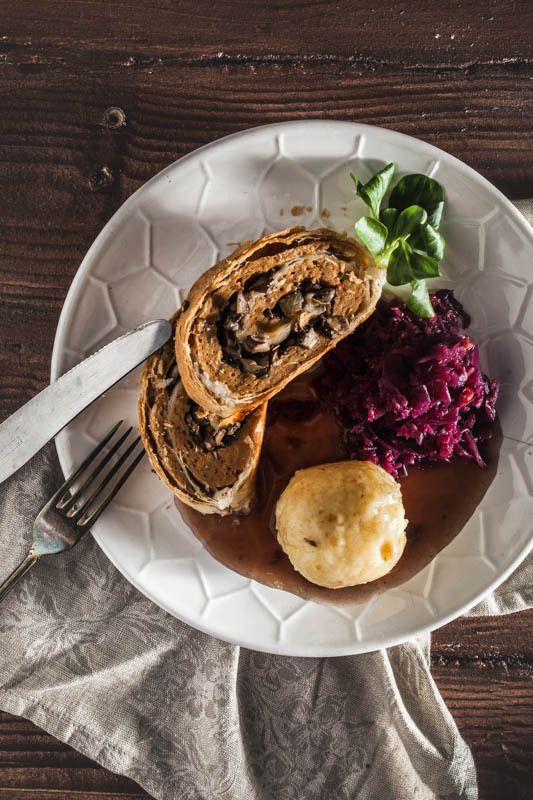 As for the taste you cannot compare this vegan roast with proper meat but rather a stuffed meat loaf. 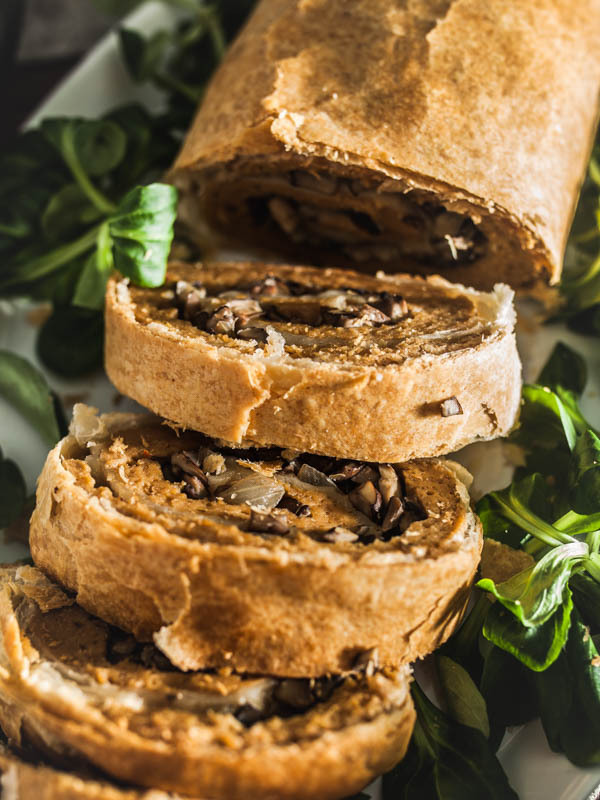 The stuffing made from mushrooms makes it nice and juicy, the puff pastry crust makes it perfectly crisp on the outside. My basic recipe is from the Vegetarierforum, I’m sorry it’s in German only. The original recipe intends to stuff the roast with bread. For my taste that’s a bit to bread-heavy. However, the basic recipe is simply awesome. In my version I merely left out the lemon and added mustard instead. Ultimately I wrapped the roast in puff pastry. I don’t have to say much more, do it? A beautifully crunchy, flaky layer of warm deliciousness that keeps the roast juicy on the inside. Pure awesomeness. Apart from that I almost forgot to mention how cheap this Christmas recipe really is. For all the ingredients (sides included) I paid less than 20€. The perfect meal if you’re on a budget. Mix the wheat gluten with the yeast flakes. Peel and mince (or press) the garlic and add it as well. Stir together tomato paste, soy sauce, vegetable broth and mustard. Add it to the seitan mixture and with a spoon stir it until you get a solid dough. Continue kneading it with your hands for a while, form a ball and put it aside. Clean the mushrooms and mince them. Peel the onion and garlic and dice them finely as well. Heat oil in a pan and sauté the onions before adding in the mushrooms and garlic and frying it for another 5-10 minutes. Salt lightly. Preheat the ofen to 190° lower/upper heat (170° air circulation). 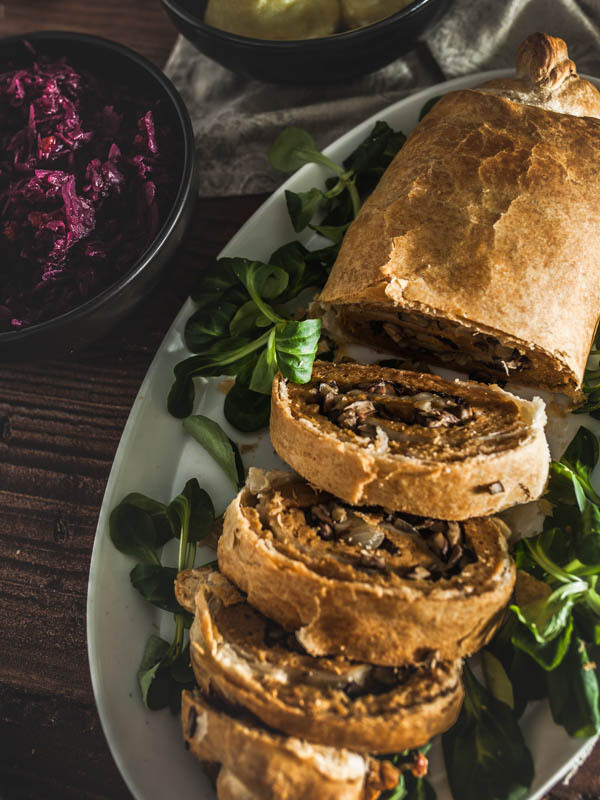 Roll out the puff pastry and place the seitan dough on top. With a rolling pin toll out the dough thinly on the puff pastry. You should leave some space in the front and the back (just like you do with Sushi). It doesn't have to be perfect. Spread the fried onions on the seitan dough evenly. Fold the dough up on the sights to prevent the stuffing from falling out. Now we're rolling the dough up, still taking care of the sides being closed. Lastly we're brushing the dough with some oil and plant milk to prevent it from drying and bake it in the oven for 50-55 minutes. Yum! This looks wonderful and I love your pictures! Is Seitan mixture allowed to stay over night for more flavour? Or there is enough flavour without leaving it over night? Greets! I about to make this! Will let you know how it turns out! It turned out great! I added some fresh sage to the mushroom stuffing. Everybody liked it! Nice recipe! 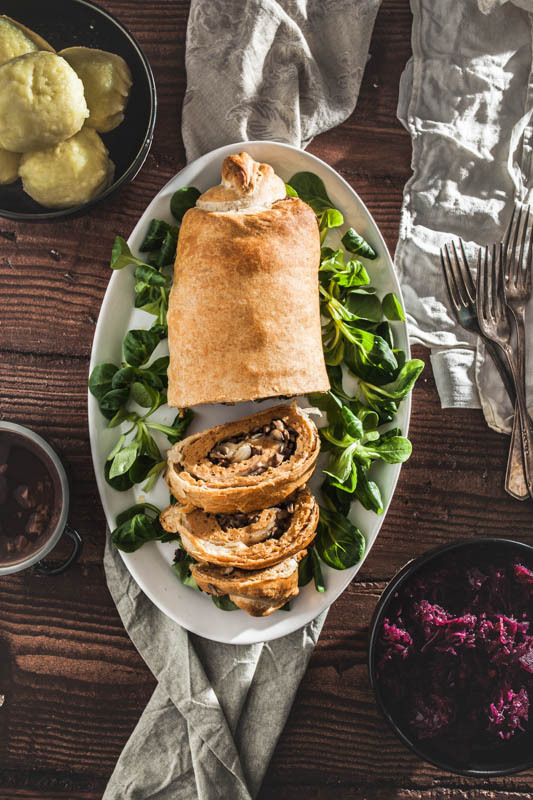 Think rice paper can be used instead of puff pastry? I can eat wheat gluten but not wheat flour products, especially white wheat flour! You mean the rice paper that is used for summer rolls? I honestly don’t think it’s suitable. The puff pastry has a much fluffier and softer texture and is much thicker which prevents the roast from becoming dry. I also have never considered baking rice paper in the oven. I’m not quite familiar with gluten free baked goods, I apologize. Gave it a try. Never got seitan so tender. Did need a bit more veg stock for the seitandough cause it was a bit to dry. But maybe it was my fault. Was the first time I didnt cook seitan and tried it in the oven. Thank you, it was a succes. Thank you so much for you comment and honest feedback. Hi there! This looks absolutely great! I am wondering if it is possible to make ahead of time and freeze uncooked? To either be defrosted or cooked from frozen? I am hoping to make it to bring to a Christmas dinner as a vegan option. Hi Karlyn, I haven’t tried freezing it but I honestly think it’s worth a try. Yes I have reheated the roast, but I definitely would recommend to bake and eat it fresh. The preheated version is a little rubber-like and more typical seitan-y. What you can do though is prepare the Seitan dough beforehand even the day before.